RENTON SENIOR ACTIVITY CENTER 211 Burnett Avenue N Renton, WA 98057 425-430-6633 // rentonwa.gov STAFF Debbie Little, Recreation Supervisor Lisa Wivag, Recreation Programmer Lori Robles, Receptionist HOURS Monday 9:00am–5:00pm Tuesday 9:00am–5:00pm Wednesday 9:00am–5:00pm Thursday 9:00am–5:00pm Friday 9:00am–5:00pm The Renton Senior Activity Center, located along the banks of the Cedar River, offers a banquet room with a beautiful view. Amenities include hardwood floors, elegant stage, outdoor patio, and kitchen. RATES RESIDENT NON-RESIDENT Friday (5-hour min.) $650 $750 Saturday (10-hour min.) $1,300 $1,500 Additional hours $130/ hour $150/hour Friday rentals are available after 5:00pm only. A security deposit of $550 is required for all events. City Officials Denis Law, Mayor Kelly Beymer Community Services Administrator Parks Commission Troy Wigestrand, Chair Cynthia Burns Al Dieckman Larry Reymann Tim Searing Marlene Winter City Council Armondo Pavone, President Ed Prince, President Pro-Tem Randy Corman Ryan McIrvin Ruth Pérez Don Persson Carol Ann Witschi Senior Advisory Committee Peggy Budziu Mij Charbonneau Bill Clapp Dorothy Cook Ruby Griffin Shirley Haddock Sandy Jensen Karla Nuss Sandy Polley Marge Reep Vicki Richards Charles Robinson Joe Stewart Kay Stone Milt Tiede PLANNING A PARTY? The Center has Space for You. BIRTHDAYS REUNIONS ANNIVERSARIES RETIREMENT PARTIES Community Services NATIONALLY ACCREDITED AGENCY CHEERS DEBBIE ON YOUR NEW POSITION! The City of Renton has selected Debbie Little as Recreation Supervisor for our Senior Activity Center. Debbie comes with over 28 years of knowledge and experience. 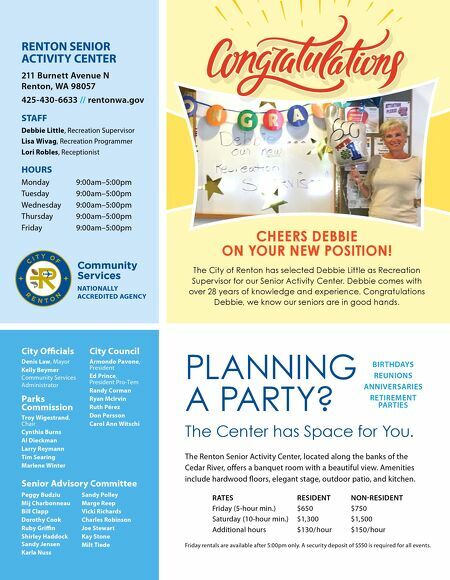 Congratulations Debbie, we know our seniors are in good hands.